Aliases: Palmer Deniro, Paul Denning, "Pal o'Mine," Scourge, "Super Soldier-of-Fortune"
Powers/Abilities: With superhuman strength, Paladin has the ability to lift/press about 1 ton and he has slightly superhuman speed, durability, agility and reflexes. Wearing thick Kevlar that can protect him from most concussive and kinetic blasts, Paladin's armor was also equipped with several types of weapons and artillery. His goggles were equipped with night vision and motion-detecting technology. Paladin carries a gun that can be set to stun or kill. Paladin was an experienced actor and is an expert in undercover work. He was an accomplished gymnast, bodyguard and combatant trained in boxing, judo and tae kwan do, and he was a skilled marksman. Paladin has used many types of weapons in combat, including paralytic gas pellets, stun grenades, radioactive isotopes, heat rays, neural disruptors, machine guns and electromagnetic pulses, and he sometimes equips or enhances his weapons to counter super-powered foes. Paladin was also an experienced pilot. Paladin briefly developed spider-powers during the Spider-Island event, including enhanced strength and agility. He eventually began transforming into a full spider-mutate before he was cured. History: (Dark Reign: Elektra#1 (fb) – BTS) – The man who would become Paladin served in the army. (Dark Reign: Elektra#1 (fb) – BTS) – When Paladin was starting out his mercenary career, one of his mentors was his old army buddy, a man who called himself the General when he was a mercenary. The General was killed by Elektra and Paladin held a grudge against her for years. (Marvel Comics Presents I#21/3 (fb) – BTS) – Paladin helped liberate a prominent Russian nuclear physicist and was warned to never return to Russia thereafter. (Daredevil I#150 (fb) – BTS) – Paladin developed a reputation as a private investigator and gun-for-hire available only for the very rich. Mort Chisolm hired Paladin to hunt down Purple Man, who had used Mort against his will. Paladin demanded $500,000 in payment. (Daredevil I#150) – When Mort arrived with only $450,000, Paladin accepted, intrigued by the case. Having heard about Daredevil's recent interactions with Purple Man, Paladin tracked Daredevil, carrying his blaster gun, and the two ended up sparring across the rooftops. When they crashed into the YWCA, Paladin saw two beautiful girls and he stopped the fight, removed his mask and introduced himself to Sandy and Connie. As they headed outside, Daredevil, surprised by Paladin's flirtatiousness with the women, managed to get the upper hand in their fight. Paladin revealed he was after the Purple Man and let the hero go about his business. (Daredevil I#152 (fb) – BTS) – Paladin continued tracking leads on the Purple Man. (Daredevil I#152) – In Central Park, Daredevil bounded past civilians Steve and Barbie to confront Paladin, who was there tracking one of the Purple Man's henchmen. As the villain fled, Paladin angrily threw a bench at Daredevil then stunned the hero with his gun, rushing off to complete his mission, one he was already losing money on. (Marvel Premiere I#43 (fb) – BTS) – Paladin was hired by Marsha Connors, who needed protection, but she refused to tell Paladin from what. (Marvel Premiere I#43) – The super-powered Phantasm and his armed men attacked Marsha and sparred with Paladin before fleeing. During the fight, Paladin was nearly thrown off the roof and had his hands burned then he opened fire on Phantasm. Demanding answers from Marsha, Paladin deduced that Phantasm was her ex-boyfriend Dennis Sutton, who had been abusive toward her. After a city-wide blackout triggered by Phantasm, Paladin found Marsha seemingly dead and he furiously went after Phantasm, who used his mob of people and his powers to fight back. After learning that Marsha had only been poisoned, Paladin rushed back to Marsha's apartment, where he told her how much she meant to him. (Daredevil I#154) – Paladin tracked down Purple Man to his base and he found Purple Man holding Heather Glenn hostage while forcing Gladiator, Cobra, Mr. Hyde and Jester to battle Daredevil. 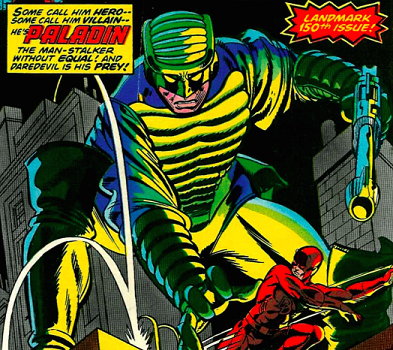 After blasting Mr. Hyde, Paladin expressed shock that Daredevil had found the villain first. Purple Man tried controlling Paladin but Paladin shot him first then sealed off his own armor to avoid Purple Man's pheromones. Paladin then jumped into the arena and helped defeat the four villains. Daredevil, using Paladin's gun, narrowly saved Heather Glenn from shooting herself at Purple Man's command then Daredevil chased Purple Man out of the building and the villain fell a great distance into the ocean. Paladin chided Daredevil, saying the loss of Purple Man had cost him a half million dollars. (Defenders I#62 (fb) – BTS) – Paladin saw a television ad put out by Dollar Bill about the Defenders seeking new members. (Defenders I#62) – Paladin went to the Richmond Riding Academy to join the Defenders but he found over a dozen other heroes there and they banded together as the "Defenders for a Day," with Hercules as their de facto leader. The main Defenders catered to the other heroes and Paladin accepted coffee from the Hulk, though he was frustrated there was no cream and sugar. (Defenders I#63) – Overwhelmed by the number of heroes there, Paladin chose to leave. (Marvel Team-Up I#108 (fb) – BTS) – Christine Michaels hired Paladin to track down her husband Walter Michaels, who she called the Street Stalker, as he'd been mutated into Thermo in a lab accident and was now leaving victims on the street. (Marvel Team-Up I#108 (fb)) – Paladin was seeking the "Street Stalker" in Central Park when Spider-Man attacked, thinking he was a mugger. They briefly sparred but then teamed up after hearing a scream and found a frozen victim who was catatonic. Paladin rushed off for dinner with Christine Michaels and Dr. Bradshaw. When Spidey showed up demanding answers from Paladin, the couple invited the hero to join them for dinner at the Gold Star but the waiter required Spidey to wear a bowtie made of webbing while he gave Paladin a pass as Paladin knew the owner. Christine explained about the "Stalker" and gave Paladin a nullifier to attach to his gun that would likely counter the "Stalker"'s powers. After making fun of Spidey for not charging for his services, Paladin retired for the night. The next day, he gave Spidey his tracer back (which Spidey had been using to follow Paladin) then they tracked the "Stalker" to a building and broke in to fight him. "Stalker" announced his code name as Thermo and easily collapsed the floor beneath the heroes. Thermo then managed to kill Bradshaw before the heroes caught up. (Marvel Team-Up I#108) – Spidey and Paladin faced off against Thermo in an alley and Paladin fired the nullifier at him but Thermo easily shook it off and defeated both heroes. (Marvel Team-Up I#109) – Dazzler joined Spider-Man and a weakened Paladin in fighting Thermo and Paladin hit the villain with the nullifier again before Thermo escaped. Paladin flirted with Dazzler, helping her get a weak Spider-Man back to her apartment, then departed for the evening. The next night, at Christine's lab, Paladin found her missing and Spider-Man showed up with a modified nullifier, having increased its intensity. Paladin and Spidey used the nullifier to track Thermo then battled the villain as well as his new gang, including Mark Hamilton, and found they had kidnapped Dazzler and Christine. Thermo was soon defeated. Paladin, thoroughly impressed with Dazzler, left the heroes behind, collected his payment and went off on his own. (Marvel Super Heroes Contest of Champions I#1) – Paladin was summoned alongside dozens of super heroes to witness the cosmic game played between Grandmaster and Death. (Avengers I#251 (fb) – BTS) – Paladin was hired to protect the riches at the casino in Utopia Cay. (Avengers I#251) – Paladin was vacationing in Utopia Cay when he saw Janet Van Dyne, the Wasp, arrive for vacation. He introduced himself to her as Paul Denning and they spent the weekend romancing each other over swimming, dancing and drinks. When Janet asked Paul what he did for a living, he told her he was freelance. Janet's friend Tinky Weissman invited them to a farewell party hosted by her friend, the Baron. That night, Paul sent Janet a note saying he couldn't make it but when Janet investigated his room, she found gun cases and photographs then she rushed to the yacht to stop him, thinking he was a supervillain. Baron Brimstone and his men attacked the casino and Paladin leapt out of the Vault, shooting stun guns. Wasp joined him and they defeated Baron Brimstone. Paladin revealed that he was Paul and later over dinner and drinks, he and Wasp danced, and he confessed his real name wasn't Paul. (Spectacular Spider-Man I#105 (fb) – BTS) – Paladin was hired by Vince Granetti to convince Janet Van Dyne to sell her shares in Nevell Stock to his company, Consolidated, ordering him to use force if necessary. (Spectacular Spider-Man I#105) – Assuming he was a villain, Spider-Man webbed Paladin against a tree but Paladin broke free and sparred with the hero. Granetti interrupted the fight then ordered Paladin to fulfill his assignment. Paladin attacked Wasp in Central Park, though he whispered it was a ruse and he wanted her to make it look good, even as he was determined to do his job. Paladin was shocked when Wasp shrank to bug-size and easily defeated him while flirting with him and inviting him on another vacation. Paladin immediately flirted back with Jan, soon ordering drinks that he paid for with his platinum card (one that had the name "Paladin" on it). Paladin delivered Granetti's message before Spider-Man arrived to check on Wasp and then left. (Spectacular Spider-Man I#106) – Granetti confronted Paladin about his failure with Jan then sarcastically ordered him to protect a barge that evening. Paladin expressed his frustration and chose to simply walk away when bodyguard Chester threatened him. That evening at the barge, Paladin was on guard when Spider-Man attacked. After they battled for a bit, they saw a civilian who got shot by a random bullet and Spider-Man rushed the man to the hospital while Paladin watched over the man's teenage girlfriend, Daphne. At the hospital, Spider-Man angrily confronted Paladin for his mixed morals in working for a man like Granetti. In the end, Paladin chose to help Spider-Man and the Wasp defeat Granetti. After flirting with Jan again, he left. (Avengers I#273 (fb) – BTS) – Paladin became acquainted with American reporter Joey while in the Middle East. (Avengers I#271 (fb) – BTS) – Paladin was hired by diamond merchants to apprehend Belguim's most notorious jewel thief. He succeeded and was soon paid. With his new fortune, he decided to celebrate and broke into Jan's apartment, hoping she'd join him. (Avengers I#271) – Jan got home and found Paladin there. She got a call then invited Paladin to accompany her to Passaic County Jail, where Jan questioned Rita Demara, the recently apprehended criminal Yellowjacket. Rita's attorneys entered the room and Wasp recognized them as the Grey Gargoyle and Screaming Mimi, members of the new Masters of Evil. A fight broke out and Paladin was soon trapped under a filing cabinet that had been turned to stone. Minutes after freeing himself, he helped the Avengers (Black Knight and Captain Marvel) apprehend Grey Gargoyle and Screaming Mimi but Yellowjacket escaped. (Avengers I#273) – Paladin greeted Wasp in a media interview and chatted with Joey briefly. (Avengers I#274 (fb) – BTS) – After spending some time with Wasp, Paladin left for Rio. (Marvel Comics Presents I#21/3 (fb) – BTS) – Paladin was hired by newspaper publisher Emmette Edison to find his daughter Dixie Edison, who had been reported kidnapped. Emmette chose Paladin because his business card claimed he would travel to the four corners of the world to solve a case. Paladin flew to Chicago to get the assignment, only to discover that Dixie had been reported in Dallas. When he arrived in Dallas, after flirting with flight attendant Tracy on the plane, he found Dixie waiting at the airport and she stated that her kidnapping had been a ruse as she was trying to convince her father to relinquish farmland to farmers in Seattle. After the "kidnappers" fired on them, Paladin took Dixie aboard the plane, where he flirted with Tracy again. He returned Dixie to Emmette and he confessed that a Florida-based corporation was forcing him to make those farms ready for toxic waste dumping. Paladin agreed to pursue the case without further payment. In Florida, Paladin bypassed ravenous alligators and confronted businessmen, who claimed they were being forced by a European crime syndicate seeking to switch America's agricultural dependency. Paladin traveled to Italy, where he learned that the KGB was forcing the issue with goals of crippling the world economy. Paladin danced with a woman at her wedding before traveling to Russia. Paladin sought out a physicist he had once liberated and the man was shocked Paladin was back in Russia. The physicist gave Paladin the lead that alien creatures called the Intergalactic Warlords, based in the South Pole, were manipulating the KGB with plans to use Earth as an armory for their intergalactic conquests. In the South Pole, Paladin was surrounded by aliens but Paladin scared them away by claiming several super hero teams were flanking him. 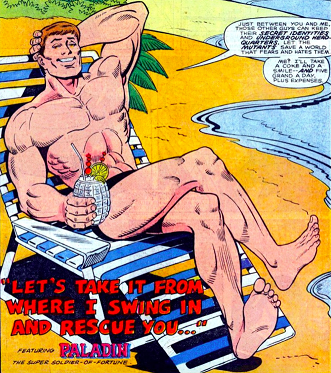 (Marvel Comics Presents I#21/3) – Paladin vacationed on a tropical island with Tracy. (Amazing Spider-Man I#320 (fb) – BTS) – Silver Sable hired Paladin to track down a foreign agent, Chakane, who was seeking to make a deal with the American company, the Life Foundation, led by Carlton Drake, in a plot against Symkaria. (Amazing Spider-Man I#320) – Spider-Man caught Paladin fighting armed men posing as caterers in a shipping warehouse but Paladin fled with the paperwork he was seeking, paperwork regarding an upcoming party at the Waldorf-Astoria. That night at the party, Paladin met up with a few men and followed them to a car dealership, not knowing Spider-Man was on his tail. As Paladin tried apprehending Chakane and Drake, Spidey intervened then a small armed group opened fire on both heroes with mini-tanks, though the heroes quickly destroyed them. Knowing his car would be impounded by the arriving police, Paladin called Silver Sable for backup and invited Spidey aboard her helicopter. Hearing the truth about Paladin's assignment, Spidey offered to help. (Amazing Spider-Man I#321 (fb) – BTS) – Silver Sable got intel on a Life Foundation front and sent Spider-Man and Paladin to get more intel. (Amazing Spider-Man I#321) – During a fight with armed men, Paladin was confused by Spider-Man's brutality in the fight. After saving the hero once, he gathered computer discs and left to turn them over to Sable, ready for a hefty bonus. Later, Silver joined Paladin and Spidey in tracking a Life Foundation plot in New Jersey, where they were building armored condos for the rich. Drake attacked, flanked by Protector Prototypes (mercenaries turned into super-strong men with no free thinking). After the battle, Silver found Chakane and learned of an assassination plot in Symkaria but Paladin said he was unavailable as he had a prior engagement. (Marc Spector: Moon Knight I#15) – The nation of Bosqueverde, newly a democracy, hired Silver Sable and her Wild Pack, including Sandman, to bring the former mercenary Marc Spector, who they didn't know was Moon Knight, to justice. She contracted with Paladin, who wondered why she needed so much man power for one man. Paladin and the Wild Pack confronted Spector and were shocked when he used weapons and agility to escape all of them but then Spector surrendered willingly. (Punisher: No Escape (fb) – BTS) – Paladin was offered ten thousand dollars to retrieve a bail hopper. (Punisher: No Escape) – Punisher bypassed security and fought through an attacking dog and armed security agents before Vincent Mangano revealed himself, explaining the traps had been a test for Paladin. Mangano offered Paladin ten million dollars to assassinate the Punisher. Paladin explained that he didn't do assassinations but he still took the job. Paladin set a trap for Punisher in Little Italy, thinking it would be easy to take him down, but after sparring with Punisher briefly, Paladin ended up hanging upside down with a chain around his ankles as Punisher escaped. That night, Paladin set up a second trap and Punisher took the bait again. Just as Paladin was prepared to deliver the killing blow, Paladin took a punch to the groin that stopped him. Punisher went after Mangano and when USAgent showed up, Paladin departed so he wouldn't be implicated, thinking USAgent was Captain America. Paladin instead took captive Punisher's aid Microchip. Later, Paladin waited at the Mangano residence and was trying to get the upper hand against Punisher but USAgent intervened and attacked Paladin with his super strength. USAgent then broke both of Paladin's legs with a shield throw and promised to take the mercenary to the Vault but Paladin managed to get away, frustrated with the loss of the money and what this would do to his reputation. 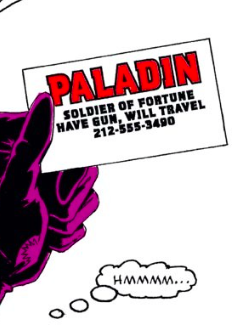 (Captain America I#381) – Needing protection, Diamondback called Paladin, getting his number off his business card. Paladin, just back from Frankfurt, flirted with Diamondback then heard about how the Serpent Society was after her. He agreed to help her free her friends Black Mamba and Asp from the villains if she promised to go on a date with him. She responded "whatever you want" and he said he'd remember those words. She took him to the Serpent Society headquarters at the Stuyvesant Arms Hotel, where she knocked out the desk manager Kenny and led Paladin inside, calling him "Pal O'Mine." With Paladin's gun drawn, they passed Bushmaster and found Asp and Black Mamba strung up. Cobra attacked, wrapping around Paladin and hitting him with his tail. Cobra hit Diamondback with poison and forced Paladin to surrender as he said Diamondback would definitely owe him more dates. (Captain America I#382) – Paladin was strung upside down as he waited for King Cobra to give the antidote to Diamondback as he promised. When Cobra didn't, Paladin raged at him. Captain America arrived to help and battled Cobra, who soon rushed off. Cap freed the prisoners and prepared to help Diamondback but Cobra returned with some of the Serpent Society (Black Mamba, Coachwhip, Rattler) but the villains were soon defeated and arrested by the Guardsmen. Diamondback then agreed to the date with Paladin. (Captain America I#385/2 – BTS) – Diamondback, Asp and Black Mamba hung out at Paladin's apartment, where he was using the alias of "Palmer Deniro. " (Captain America I#387 (fb) – BTS) – Diamondback left Paladin a note saying that they'd gone hunting for snakes. (Captain America I#387) – Captain America sought out Paladin, who was preparing for a trip to Geneva, to seek out Diamondback and her friends. They questioned Puff Adder and Rock Python in police custody and learned that Diamondback, Asp, Black Mamba and Anaconda had been taken by M.O.D.O.K. Paladin canceled his trip and after being waited on by Edwin Jarvis at Avengers Mansion, Paladin accompanied Captain America and his pilot John Jameson to A.I.M. Island. They questioned Alessandro Brannex, with his aids Mandy and Aldo nearby, about M.O.D.O.K. but got nowhere. They soon got an alert from Diamondback and tracked her to a cruise ship in the ocean. Once there, John went into a trance and the three had to use ejector seats with parachutes to get to safety before M.O.D.A.M. attacked. (Captain America I#388) – Paladin (who was resistant to M.O.D.A.M. 's mind control) landed in the ocean then lodged bullets into M.O.D.A.M. 's converter crystal and exhaust pipe, capsizing her in the ocean. Captain America secured the unconscious Jameson on a rubber raft while Paladin retrieved his shield from under the water. Cap called Peggy Carter for help but soon, Moonstone and Blackbird attacked. Blackbird wrapped Paladin in wire and let him sink while Cap and Jameson were defeated. (Captain America I#389) – Paladin freed himself from the wires and saved Cap's life then shot Moonstone out of the air as Cap defeated Blackbird. Vision arrived in a Quinjet and took John to safety and the two villains into custody then Cap and Paladin went to investigate the ship on a Skycycle. They tracked the cruise ship and snuck aboard that night, only to be attacked by a group of super-powered villainesses, the Femizons. (Captain America I#390) – Paladin shot through Dragonfly's wing before Gypsy Moth unraveled the threads of his costume. He fled on the boat, shooting Gypsy Moth before Yellowjacket disarmed him and Mindblast seized mental control of him. Ice Princess froze him in place as Frenzy and Ferocia pummeled him then Cap got him free. The women surrounded them and Paladin was pulled away by Whiplash. Frenzy, Pink Pearl, Titania and Poundcakes each grabbed a limb and threatened to pull him apart unless Cap surrendered, which Cap did. Paladin was trussed up and taken with Cap to be questioned by Dansen Macabre and Nightshade then strip-searched by Titania. Mindblast delivered Paladin to Superia soon after and she announced her intention to turn Cap and Paladin into women. (Captain America I#391) – Superia and Nightshade placed Paladin and Captain America in stasis tubes and began experiments, planning on turning them fully into women within 12 hours. With the help of Asp and Black Mamba, Cap was freed then Paladin kicked through the glass. Asp gave Paladin her costume and Black Mamba gave Cap hers so they could blend in among the women of Femizonia. Paladin then went with Asp to look for Diamondback. (Captain America I#392) – Asp and Paladin found Diamondback but they were attacked by Whiteout, Iron Maiden, Ferocia and Ice Princess, and Paladin briefly sparred with Iron Maiden. After defeating the villains, they adopted their costumes with Paladin wearing Whiteout's. They soon found Cap, who had defeated Superia, and Vision picked up the group in an Avengers Quinjet. (Captain America I#393) – Paladin and Cap exchanged handshakes and claimed respect for each other then Paladin took Black Mamba and Asp back to his hotel room with him. (Excalibur I#36 (fb) – BTS) – Silver Sable formed a team of Outlaws, including Paladin, Sandman, Rocket Racer and Prowler, all of them known in some circles as criminals and vigilantes. The team was hired to retrieve Dr. Walshe from Darkmoor Research Center. (Excalibur I#36) – At Darkmoor, the Outlaws attacked the super hero team Excalibur in an attempt to grab Walshe and retrieve stolen Symkarian technology, a bionuclear stimulator that could threaten all of Earth. During the battle, Paladin stunned Phoenix then kissed her. The teams joined forces when they learned that Walshe was actually a variant of Arnim Zola, one who had been experimenting with radiation on human clones. Zola launched a creation of his called the Shepherd as well as the irradiated clones and the Outlaws and Excalibur narrowly contained the threat, which ended when Meggan killed Zola. Paladin and Phoenix flirted one last time. (Marvel Comics Presents I#86/4 (fb) – BTS) – Paladin was hired by the owners of a baseball stadium that had received a bomb threat. (Marvel Comics Presents I#86/4) – At the stadium, Paladin argued with security man Burke before investigating some suspicious men, one of whom fired a gun at Paladin multiple times. In the end, Paladin stopped the terrorists and exposed Burke as their leader. (Silver Sable I#3 – BTS) – Silver Sable hired Paladin to track down Dmitri Petrovich. (Silver Sable I#6) – Paladin hunted down Dmitri Petrovich and Hydra agents in South America, and found the villains hunting down monkey mutates. Paladin escaped but captured one of the soldiers. Paladin soon learned that Petrovich was spear-heading the Genesis Coalition, working with an old scientist to create animal hybrids. Later, at the Symkarian Embassy in New York, Paladin planned to wait for Silver Sable to return but Lorna Kleinfeldt convinced him to tell her what he'd found. (Silver Sable I#7) – At the embassy, Paladin sparred with Lorna, who showed off her strength, then heard her argue with Jonathan Lee about budgets. (Silver Sable I#8) – Paladin led Silver Sable and the Wild Pack against the Genesis Coalition, searching for Nazi war criminal Franz Lubischt. After Sable's men tortured some of the criminals, they found Lubischt's base and Sandman stormed his way in past Paladin, altering the alarms. They freed many men who had been changed into animal hybrids. Paladin fought off a gorilla-man then helped Silver Sable as the villains escaped, Sable being distraught at learning her father was still alive. (Silver Sable I#15) – Silver Sable sent Paladin and other members of the Wild Pack to Kentucky to find Viper but they instead confronted one of her Pit-Vipers. (Silver Sable I#16) – In Somalia, Silver Sable, the Wild Pack and the Intruders (including Paladin) were hired to insure safe delivery of foods and products to the locals. They fought insurgents and later fought the Bio-Genes (Leecher, Lightbright, Mali, Transfaser). (Silver Sable I#17) – Baron Strucker and Hydra attacked in Somalia and the Wild Pack worked to contain the situation, even as the Bio-Genes kept attacking. Paladin yelled that the Intruders needed more money for their work. (Silver Sable I#19 (fb) – BTS) – Sable discovered Jonathan Lee had been embezzling from her and assigned Paladin to track him. (Silver Sable I#19) – At the Symkarian Embassy, Paladin worked with Lorna and Uncle Morty on tracking Lee. Paladin tried asking for more money but Lorna silenced him. Lightbright arrived, defecting from the Bio-Genes, but she was uninterested when Paladin flirted. (Silver Sable I#21) – Paladin tracked money launderer Maurice Grauline to Toronto and he chased the man until he got the whereabouts of Lee. (Silver Sable I#23) – Paladin tracked Lee to the Plaza Hotel in New York and confronted him. Paladin dangled Lee from the roof, intimidating him into admitting that the Foreigner was behind the embezzling. He had Sable pulled out of a meeting so he could give her the news. Paladin then met with Sable to tell her about the Foreigner. (Silver Sable I#25) – Silver Sable sent the Intruders to Bosnia to fight the Genesis Coalition, who were posing as Hydra agents. During the battle, Paladin tried reasoning with the villains, telling them that Silver Sable paid better than von Strucker. (Silver Sable I#30) – At the Symkarian Embassy, allies of Silver Sable (including Paladin, the Wild Pack and the Intruders) gathered to discuss the recent arrest of Silver by the American government. Lorna, Uncle Morty, Samantha Powell and Ernst Sablinova warned the operatives that they could be set up to be arrested as well. (Silver Sable I#33) – Paladin was present when Silver Sable announced that she would no longer be going on combat missions. (Silver Sable I#34) – At the Symkarian Embassy, Paladin joined the Intruders on a mission to retrieve an artifact in Antarctica. (Cable II#49 (fb) – BTS) – Paladin was hired by Donald Pierce to protect the Hellfire Club. (Cable II#49) – Working with Hellfire Club soldiers including Taft, Paladin fought Cable when he attacked but Cable exploded the building around them and defeated Paladin. (Heroes for Hire I#10 (fb) – BTS) – Professor Wolfgang Hessler, a scientist who designed a bio-weapon, took refuge in Symkaria and Silver Sable contracted with Sandman, Nomad (secretly a disguised Madcap), Cat and Paladin to protect him, calling them her Wild Pack. (Heroes for Hire I#10) – In a high mountain sanctuary, Silver Sable and her operatives watched over Hessler. Paladin grew frustrated when "Nomad" wouldn't speak but "Nomad" soon revealed he was actually Madcap. The Heroes for Hire attacked and Deadpool shot Paladin multiple times. (Heroes for Hire I#11) – Paladin was impressed by Misty Knight's marksmanship and strength but he soon defeated her and in time, the Heroes for Hire were all apprehended. The Heroes later escaped and Luke Cage shockingly turned on them while under the control of the Master of the World. The Wild Pack and the Heroes worked together but the Master of the World managed to teleport Cage and Hessler away. (Generation X I#53 (fb) – BTS) – Paladin began working with Adrienne Frost as an operative from time to time. She hired him to retrieve a samurai sword for him. It was being held by Noy, a member of the Rising Sons, a team of super-powered operatives in Madripoor. He spent time studying the Sons. (Generation X I#53 (fb)) – In Madripoor, Paladin was attacked by the Rising Sons. After the battle, they believed him dead. Badly wounded, Paladin made his way back to Adrienne in Massachusetts, where she was now the headmaster of an academy training mutants. (Generation X I#52) – Jubilee was jogging through the woods when she saw Paladin collapse, muttering that he needed to see Adrienne. (Generation X I#53) – Paladin explained what had happened while flirting with both Adrienne and Jubilee. After he recovered, he prepared to head back to Madripoor and the students of Generation X sought to join him. In Madripoor, Paladin teamed up with Jubilee to track Noy aboard a speeding train while the kids fought members of the Sons. Paladin and Jubilee then found all of the Sons aboard the train. (Generation X I#54) – On the train, Paladin stunned the bulletproof Tough Love, saving Jubilee. Skin, Chamber, Husk and Synch arrived to help them defeat Spoilsport, who had punched Paladin's goggles off, then Paladin snuck off on his own to go after the sword. Dragonwing nearly threw Paladin from the train before Jubilee rescued him. The Sons were defeated and they retrieved the sword, returning it to Adrienne. (Captain America IV#31 - BTS) - Paladin left his card with Captain America's landlady Agnes because he needed Cap's help. Cap contacted Paladin and then helped him. (GLA I#2) – Paladin turned down an offer to join the Great Lakes Avengers. (New X-Men: Hellions I#4 (fb) – BTS) – Paladin and Diamondback were hired by Nick Fury of S.H.I.E.L.D. to retrieve a bio-weapon from the company Genetassist. (New X-Men: Hellions I#2) – Paladin and Diamondback staked out Genetassist. (New X-Men: Hellions I#3) – Paladin and Diamondback broke into Genetassist, where they found the briefcase they needed, but then the Hellions attacked, determined to take it from them. Paladin and Diamondback did their best against the mutants, with Paladin overcoming Tag's psychic powers and turning Rockslide's fist back on himself. He helped the mutants realize they were stealing a biological weapon but Hellion knocked Paladin out and took the briefcase. (New X-Men: Hellions I#4) – Paladin and Diamondback reported back in to Fury. Later, the Hellions surrendered the weapon to Fury but it was damaged. Paladin still wanted to get paid. (Daredevil II#79 (fb) – BTS) – Director Davis of the F.B.I. convinced Paladin to accept an assignment to shoot Daredevil. (Daredevil II#79) – Paladin downed Daredevil with a shot from a helicopter then called Davis to confirm the hit. (Amazing Fantasy II#16/2 (fb) – BTS)) – Paladin was hired by an oppressive organization to help bring in rebels and he let the rebels believe he was affiliated with them. (Amazing Fantasy II#16/2) – Paladin worked with the rebels but came to believe in their cause. After they were apprehended, he took his money from the organization but didn't stop their base from being blown up by the rebels. (Heroes for Hire II#1 (fb) – BTS) – Misty Knight formed a new Heroes for Hire team with members Colleen Wing, Humbug, Tarantula (Maria Vasquez) and Black Cat, and she recruited Paladin to be on retainer as back-up alongside Orka and Shang-Chi. (Heroes for Hire II#1) – Paladin, Orka and Shang-Chi showed up to help fight villains Bloodshed, Equinox, Goldbug, Ghost Maker, Grindhouse, Kogar, Shadow Slasher and Shockwave, villains employed by Misty's ally Vienna (Angela Tortelli). (Heroes for Hire II#2 (fb) – BTS) – S.H.I.E.L.D. hired Paladin to find Captain America. (Heroes for Hire II#2) – The Heroes for Hire learned about Goliath (Bill Foster) being killed and they argued with Iron Man over the Superhuman Registration Act. Tarantula and Paladin argued that Goliath was an enemy combatant, angering the others. Paladin was skeptical when Misty led the team to meet with Mister Qui, a mystic who used the mystical Pixiu, who she hoped would track Captain America. The Pixiu located Cap quickly but first the team went to visit Detective Benny Simmons, who had come across a criminal group harvesting organs. After Mr. Fantastic started tracking the organs, which were tied to Skrulls, the team went after Cap in a safehouse and found him with Luke Cage. Paladin activated a beacon, betraying the team. He put on a gas mask, threw paralytic gas pellets around to stop the others, avoided Cap's shield with an electromagnetic field generator, hit Luke with an electric zap and made fun of Misty's altruism then called S.H.I.E.L.D. to tell them he'd captured Cap. (Heroes for Hire II#3 (fb)) – Before the S.H.I.E.L.D. agents arrived, Shang-Chi beat up Paladin, knocking him out. He then switched Cap and Paladin's costumes. (Heroes for Hire II#3) – S.H.I.E.L.D. agents, including Sikes, picked up the unconscious "Captain America," not realizing that it was Paladin. (Civil War: Battle Damage Report – BTS) – Marking the six-month anniversary of the ramification of the Superhuman Registration Act, Tony Stark researched several superhuman operatives, including Paladin. (Heroes for Hire II#8) – A S.H.I.E.L.D. agent called in Paladin and initially teased him about the loss of Captain America then he offered Paladin ten million dollars to assemble a team to go to the Savage Land and acquire Moon Boy. Paladin showed up to the Heroes for Hire and Misty was furious with him. He chided her first for not paying her employees then offered them one million each to join him on the Savage Land assignment. (Heroes for Hire II#15 (fb) – BTS) – Paladin snuck a radioactive isotope into the food of his allies so he could track them later. (Heroes for Hire II#9) – Aboard the S.H.I.E.L.D. Helicarrier, Paladin and the Heroes for Hire heard about the assignment to retrieve Moon Boy and how scientists wanted to study Moon Boy's genome for disease-prevention purposes. Paladin joined the team on a boat to the South Pole, although they openly distrusted Paladin. In the Savage Land, Shang-Chi grew angry at Paladin for killing a mosquito then giant insects attacked the team. (Heroes for Hire II#10 (fb) – BTS) – The team became scattered. Paladin and Black Cat were knocked over a cliff and Paladin used a bug to break his fall. He roasted the bug to eat and bandaged up Black Cat. (Heroes for Hire II#10) – When Black Cat awakened, she lashed out at Paladin for having bandaged her under her costume. Shang-Chi (with Tarantula) broke up their sparring, choking Paladin out until Humbug revealed himself in a new costume, revealing that he could now control the giant bugs. They rode the giant bugs to find Misty and Colleen, who'd interfaced with Devil Dinosaur and Moon Boy, and they got Moon Boy away. Humbug warned that the insects had told him of a major problem brewing in New York City. (Heroes for Hire II#11) – The Heroes for Hire and Paladin returned Moon Boy to New York City, where Hulk had invaded the city with his alien allies. They tried to deliver Moon Boy to Derek Khanata and Scorpion (Carmilla Black) of S.H.I.E.L.D. but were told to keep him until the crisis was over. Paladin chose not to stay with the team, knowing they didn't trust him. Before he left, he admitted that he'd seen Black Cat naked. (Heroes for Hire II#11/2 (fb) – BTS) – Agent Sareva of S.H.I.E.L.D. hired Paladin to track Scorpion to a police evidence locker and to throw a fight with her. Sareva predicted that when Scorpion used her poison touch, Paladin's enhanced strength would allow him to survive. (Heroes for Hire II#14 (fb) – BTS) – Paladin was given an antidote to the Scorpion's poison to help him survive. (Heroes for Hire II#11/2) – Scorpion broke into the locker and Paladin revealed himself, recognizing that he had a chance to loot gathered money. Scorpion drew "Cockroach" Hamilton's gun to fight back. 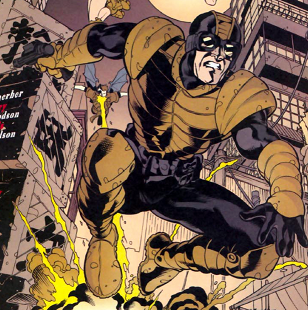 (Heroes for Hire II#12/2) – When Paladin saw Chemistro's gun and realized it could turn things to gold, he prepared to run with it, considering it a great payday, but Scorpion broke the gun with Whiplash's whip. Paladin fired Gladiator's buzz-saws at her then he used the Melter's rays against her but Scorpion turned the Stilt-Man's stilts on Paladin. As Scorpion moved in to kill Paladin, he drew a gun on her. (Heroes for Hire II#13/2) – Paladin threatened Scorpion, ordering her to let him go, but she hit him with her poison and believed him dead. Paladin called Sareva to make sure his payment came through and he confirmed that his bonus for throwing the fight was included. (Heroes for Hire II#14 (fb) – BTS) – In the chaos of the Hulk war, Paladin hacked databases, getting access to intel including the whereabouts of Hulk's armies and holdings. (Heroes for Hire II#14) – Paladin revealed he was alive to Misty, Shang-Chi and Black Cat, who he believed was attracted to him. Misty demanded intel that would help her save Colleen and Tarantula, who'd been apprehended by the Hulk's forces. Paladin refused to help provide intel until Misty promised to let him have the Moon Boy payment all for himself. Paladin then stole a S.H.I.E.L.D. tank but planted evidence that would incriminate Misty in the theft. Paladin drove the tank into the Catacombs, where they found Miek leading an alien insect army and Humbug transformed into one of them. (Heroes for Hire II#15) – The Heroes for Hire, Moon Boy and Paladin battled Humbug, who had been corrupted by the alien insects. Paladin used his gun in the battle and Moon Boy ended up hurt. Paladin admitted he could track the others through the radioactive isotope and they soon found Colleen and Tarantula, very disoriented from their exposure to nerve maggots. Paladin grew impatient when Shang-Chi went after Humbug and soon took off with the full team. He prepared to take the shackled Moon Boy in to S.H.I.E.L.D. and he flew away with his acquisition despite the others begging him not to. (The Last Defenders I#3 (fb) – BTS) – The Carnelian ambassador hired Paladin to thwart a thief of sensitive documents. 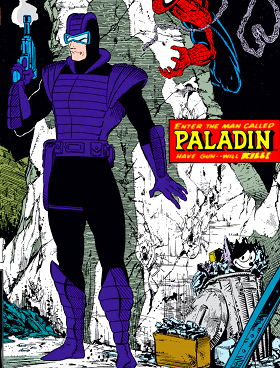 (The Last Defenders I#3) – As Paladin finished the Carnelian assignment, he was found by Nighthawk, who offered him money to join him on assignment alongside Junta and Atlas. The four interrupted U-Man, members of the Brand Corporation and Quintronic Men who were raiding an oil platform, and a battle broke out. (The Last Defenders I#4) – As their targets were defeated, Paladin and the others saw Warlord Krang fighting others below. Government authorities and the authorized team of "Mighty" Avengers (Sentry, Wasp, Wonder Man) showed up. 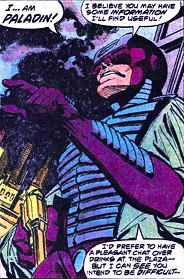 Nighthawk revealed that his team formation was not sanctioned by the government and that he'd chosen Paladin and the others off the list of potential Initiative recruits kept by the government. The Avengers chose not to complete any arrests but Nighthawk disbanded the team. Junta wanted to partner with Paladin but Paladin wasn't interested. (Iron Man: Director of S.H.I.E.L.D. I#30 (fb) – BTS) – Paladin was hired by Nasim Rahimov in Kirikhstan to act as his bodyguard. Rahimov then threatened a nuclear attack. (Iron Man: Director of S.H.I.E.L.D. I#30) – When Iron Man and S.H.I.E.L.D. agents attacked, Paladin gave the hero a message from Rahimov then hit him with a gun blast modified with Stark tech that depowered his armor. (Iron Man: Director of S.H.I.E.L.D. I#31) – Iron Man got the upper hand with Paladin by channeling his Extremis powers. Paladin tried convincing Iron Man to hire him but Stark knocked him out and left him on the ground. (Iron Man: Director of S.H.I.E.L.D. I#32 (fb) – BTS) – Paladin was questioned and he gave up intel on Rahimov in exchange for six weeks "career counseling" with S.H.I.E.L.D., giving him the promise of more jobs. (Dark Reign Files - BTS) – Quasimodo researched Paladin for Norman Osborn, who was now in charge of the superhuman efforts of the government and considered Paladin as a potential recruit for the Thunderbolts. (Dark Reign: Elektra#1 (fb) – BTS) – Paladin heard about a hit put out on Elektra, who was in the custody of H.A.M.M.E.R. Wanting the two million dollars, he gladly took the contract. (Dark Reign: Elektra#1 (fb)) – Paladin snuck aboard the H.A.M.M.E.R. Helicarrier, posing as a doctor until he got access to Elektra, who was in restraints. After knocking out a nurse, Paladin reminded Elektra of his long-term grudge against her and he punched her in the jaw, knocking a tooth loose. As he prepared to kill her, Elektra spit the tooth into Paladin's mouth, choking him, then she used his own technology to free herself and stabbed Paladin through the side. (Dark Reign: Elektra#2 – BTS) – Norman Osborn ordered his soldiers to restrain Paladin, considering him as a member of the Thunderbolts. (Dark Reign: Elektra#4 (fb) – BTS) – In exchange for his life, Paladin agreed to let Osborn have full access to his bank accounts and intel. (Thunderbolts I#129 (fb) – BTS) – After his organization H.A.M.M.E.R. replaced S.H.I.E.L.D., Norman Osborn recruited Paladin to join his new shadow team of Thunderbolts alongside Ghost, Ant-Man, Headsman and Black Widow (secretly Natasha Romanova posing as Yelena Belova). (Thunderbolts I#128) – Osborn put together a complex plot to win the President of the United States over to his side. During the mission, Paladin piloted the Thunderstrike in waiting. (Thunderbolts I#129) – Piloting the Thunderstrike, Paladin caught Headsman in the air. Later, the team moved to their new headquarters, the Cube, a former supermax prison, where team leader Black Widow assigned them their next target: Deadpool. (Deadpool III#7) – Norman Osborn confirmed the next target for the Thunderbolts, including Paladin, was Deadpool. (Deadpool III#8) – At Avengers Tower, the Thunderbolts closed in on the attacking Deadpool. (Thunderbolts I#130) – During the battle, Paladin fired a large gun at Deadpool and watched as Black Widow detonated a grenade near him. Osborn ordered the team to let Deadpool go so they could track him and find out how much intel he'd released to Nick Fury and Paladin was shocked to hear Osborn had weaponized the cure for cancer in a weapon against Deadpool. Deadpool attacked, savagely using sonic bombs, then knocked Paladin out with a kick to the jaw. (Deadpool III#9) – Paladin awakened and opened fire on Deadpool to protect Black Widow (who Paladin flirted with) but Deadpool teleported away. Osborn checked in with the team and Paladin lead the others in an Oscorp van in pursuit of Deadpool but Deadpool blew it up. They soon led Deadpool into a trap and caught him. (Thunderbolts I#131 – BTS) – The Thunderbolts took Deadpool to Osborn while Paladin went to the med-bay for treatment. (Thunderbolts I#132) – In the Mess Hall, Paladin got to know his teammates' eccentric and complex personalities. 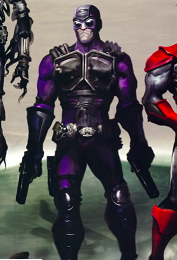 The Thunderbolts were sent to Madripoor to recruit Mr. X. Paladin and Black Widow posed as ballet performers and sparred with Mr. X as the civilians evacuated the theater but he willingly went with them, joining the team as they left a body double behind to leave the public thinking he was dead. (Thunderbolts I#133) – At the Cube, Paladin was engaging in target practice when Ant-Man opened up to him about his fears and insecurities. Paladin shared that he didn't mind killing people as part of a job but Mr. X's killing of civilians concerned him. He also stated that if things blew up with Osborn in control, Paladin would only worry about himself. (Thunderbolts I#134) – With new team members Scourge (secretly Nuke) and Mr. X, the Thunderbolts were sent to hunt down Songbird. They fired missiles at her and Black Widow revealed her true nature as Natasha Romanova in order to save Songbird. (Secret Warriors I#7) – The Thunderbolts, including Paladin, tracked Black Widow and Songbird to one of Nick Fury's safehouses. (Thunderbolts I#135) – Scourge took the lead as the Thunderbolts hunted down the two women in the woods. Paladin carried a rapid-fire gun with him and they soon apprehended their targets as well as Nick Fury in a New York safehouse. Osborn revealed he'd been playing the women the whole time. He ordered the Thunderbolts to execute the two women and Paladin muttered that he was a soldier and this was just business. (Thunderbolts I#136) – Scourge ordered Headsman to kill Black Widow and Paladin, having second thoughts, stated they shouldn't. Headsman instead turned against Scourge, revealing him as a cyborg, then Paladin fired at Black Widow's cuffs, freeing her. As the women fled, Paladin shot at Mr. X, who tossed a sword into Paladin's shoulder. Paladin then downed Scourge with gunfire, saving Headsman. Mr. X turned on them but Ghost took him out. After Ghost phased the blade through Paladin's wound, removing the sword, Paladin wanted to run but agreed to stay on the team. 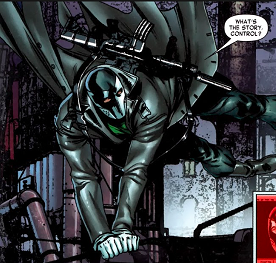 Ghost would scramble the memories of Mr. X and Scourge, and they would lie to Osborn about the escape of the women, allowing them to continue being Thunderbolts and earning money. (Captain America: Reborn I#3) – The Thunderbolts, including Paladin, worked to secure the rogue Captain America (James Barnes) in their ship. Paladin, piloting, detected a bogie just before Falcon (Sam Wilson) attacked, blasting through the glass and punching Paladin. He swiftly saved Captain America. (Thunderbolts I#137) – At Osborn's order, the Thunderbolts forcibly recruited Iron Fist, brainwashing him into service. Paladin, after being annoyed with Ant-Man at lunch, went after Luke Cage, hitting him with a neural disruptor but Luke was stronger than Paladin bargained for and he was tossed through a window, breaking bones in his face. Paladin ultimately needed the other Thunderbolts' help to bring him in. Later, he freed Luke from restraints, ostensibly to get revenge, and was badly beaten down as a result. Luke and Iron Fist then escaped. Osborn was furious, realizing someone was working against him, not knowing that the Thunderbolts had banded together to stop the recruitment and brainwashing of heroes, not wanting to be replaced. (Thunderbolts I#138) – Paladin was watching TV with Ant-Man, who he teased for not going to the gym more, when they were summoned by Scourge (who shot the TV) for a mission. Mr. X had run off to Colombia and the Thunderbolts pursued, seeing him battle guerrillas in the jungle. Paladin and Ant-Man chose to stay out of the conflict when fighting broke out among the others until the guerrillas drew in and the team battled together. Scourge ordered Paladin to use lethal force and all the guerrillas were killed. Later, aboard the Zeus ship, Osborn gave the team a new mission: to hunt the inner circle of the Atlas Foundation. (Spider-Woman IV#5) – The Thunderbolts, including Paladin, were sent after Spider-Woman (Jessica Drew). (Spider-Woman IV#6) – Paladin warned Spider-Woman to stand down but she fought back, defeating a few of the villains and blowing up their ship before escaping. (Thunderbolts I#139) – Paladin spent time studying the Agents of Atlas and determined the team wasn't ready to face them. Osborn met the team and introduced new team member Grizzly, who had specific experience with their targets. The Thunderbolts attacked an Atlas Foundation base in Louisiana, where they discovered scientists creating a caustic gas. They destroyed the plant and Mr. X killed some of the scientists so that the Agents of Atlas would show up. Wearing earplugs to block out Venus' powers, Paladin turned a heat ray on Namora before she hit him with a tree trunk. Gorilla-Man held Paladin captive but Paladin refused to admit who his employer was. Nuke then seemed to disembowel the Uranian (actually a mental illusion). (Thunderbolts I#140) – Another fight broke out between the teams and Paladin downed Namora with a heat ray, Namora having already been weakened from the toxic waste in the air. Venus screamed, causing the Thunderbolts to experience their worst nightmares. Paladin dreamed that Osborn controlled him, denying him a chance to be a hero. The Agents of Atlas escaped and the Thunderbolts regrouped with Scourge furious at their failure but Ghost went missing. Osborn, through a holographic projection, told the team how proud he was of them and called him for a major battle to Broxton, Oklahoma but Scourge shockingly fired at the projection and the bullet passed through and killed Headsman. (Thunderbolts I#141) – Osborn summoned the Thunderbolts to battle the Asgardian gods and assembled heroes in Broxton, Oklahoma. Paladin went into professional mode even as Ant-Man freaked out about the mission. As they approached Asgard, Paladin spotted the archer Hogun and ordered them to evacuate the Zeus just in time. He headed down with a parachute as the ship exploded. Scourge was furious at Paladin not waiting for orders and said he wouldn't tolerate further insubordination. The Thunderbolts raided the Asgardian armory and when Paladin considered stealing some loot, Scourge opened fire on him in a fury. The team retrieved the Spear of Odin as ordered then Mr. X killed an Asgardian before the "Mighty" Avengers (Amadeus Cho, Quicksilver, Stature, USAgent, Vision/Jonas) attacked. (Thunderbolts I#142) – Vision cornered Paladin, questioning him on his motives with the Thunderbolts but Paladin grew angry and threw the Spear of Odin at him, collapsing the roof on both groups. Paladin grabbed the Spear but USAgent attempted to grab it back, and Paladin let him take it. Sentry hit Asgard, causing the buildings to collapse. Scourge then grabbed the Spear. (Thunderbolts I#143) – As the Thunderbolts regrouped, Paladin shot Scourge right in the face, trying to get the Spear away from him. Grabbing the Spear, Paladin stated he was done following madmen like Scourge and Osborn. Grizzly attacked Paladin but Ant-Man defeated Grizzly. After the Avengers defeated the other Thunderbolts, Paladin went off on his own with the Spear, knowing he would likely be hunted by those wanting the power. (Shadowland: Blood on the Streets#2 (fb) – BTS) – Criminal Mikey Fortunado hired Paladin to kill his brother Bobby Fortunado. Paladin collected half the money up front but Mikey was killed before Paladin could finish the assignment. He assumed that Bobby was behind it. (Shadowland: Blood on the Streets#1) – Paladin watched from afar as the Shroud left Mikey's apartment. Later, outside Bobby's place, he attacked Shroud. (Shadowland: Blood on the Streets#2) – Paladin sparred with Shroud on the rooftops, explaining that he'd planned to rob Bobby to get his money back. Shroud got the upper hand and claimed he was trying to solve Mikey's murder. Later, Paladin returned to Bobby's apartment and found Bobby and another man dead inside. He was planning to rob the safe when Misty Knight entered and assumed he was responsible for the murders, so they drew guns on each other but just then Bobby's armed men entered. (Shadowland: Blood on the Streets#3) – Paladin and Misty Knight were fleeing Bobby's men, who'd opened fire on them, when Silver Sable arrived, helped them escape and got them back in her safehouse for protection. Paladin asked Silver Sable about the Symkarian war she'd recently been in then she discussed finding other criminals dead. They wondered if Mr. Negative might be behind the killings, seeking to frame Daredevil, and Paladin went to bust some heads in Chinatown to shake down any information he could. A few nights later, Paladin was fighting men and demanding answers when the Hand attacked, determined to kill him for causing strife in their holdings, but Shroud narrowly saved Paladin. (Shadowland: Blood on the Streets#4) – Misty, Silver Sable, Shroud and Paladin exposed Rafael Scarfe and other corrupt cops as the murderers. When the Hand attacked, Paladin used his sniper rifle and hologram technology to kill some of the ninjas and soon, Scarfe and the others were arrested. (Heroic Age: Heroes#1- BTS) – Captain America researched Paladin as part of his new government Initiative position. (Amazing Spider-Man II#656) – Paladin went to the Night Nurse to treat an injury. While there, he heard news about Marla Jameson being killed and the killer Massacre murdering innocents on Spider-Man's watch. When Spidey walked in, Paladin taunted him and Spidey lashed out in a fury, threatening to hit Paladin. (Heroes for Hire III#2 (fb) – BTS) – Misty Knight set up a new Heroes for Hire operation, where she would hire heroes for specific assignments while keeping her own identity a secret. Paladin agreed to work up background and intel on assignments and also act as "janitor," working clean-up on various assignments as needed. (Heroes for Hire III#1) – Paladin monitored heroes Falcon, Black Widow, Moon Knight and Elektra as they aided Misty Knight in shutting down the Atlantean drug, Hook. (Heroes for Hire III#2 (fb) – BTS) – Paladin heard about military grade weapons being on the streets and used in a number of murders, including that of five police officers. (Heroes for Hire III#2) – Paladin paid off Freddie, an attendant, so he could visit the morgue and check the bodies. As he was talking to Misty about her recent brutal methods, she stated that arms dealer Derin Vitali was behind things but Paladin had a hunch it was more than that after seeing the guns fused to the flesh of the corpses. He called in Satana, who identified the guns as Soulcutters, demon weapons that corrupted their users. Paladin delivered the intel to Misty, who had Silver Sable and Ghost Rider in the field to defeat the man behind it, Baron Brimstone. While on the phone with Misty, who claimed she had been in her control room for four months without going outside, Paladin discovered her control room was empty. (Heroes for Hire III#3) – Misty called Paladin in for an assignment but he had to finish a freelance job first. Misty informed him that Simon Serrati was delivering human trafficking victims to the North Island Mob that night. She called in Moon Knight to handle it and he found women from Savage Land tribes as the victims as well as dinosaurs. Paladin, keeping his business personal, staked out Luke Cage, Jessica Jones and Danielle Cage then Colleen Wing and Iron Fist, who attacked. As Paladin fought Iron Fist, he gave advice on how to beat dinosaurs. Paladin reasoned with Iron Fist to help him help Misty and he offered to pay Iron Fist when he was reluctant to revisit Misty after their recent break-up. (Heroes for Hire III#5) – Paladin chided Iron Fist for having left Misty after she lost her baby and Iron Fist wondered if Paladin had feelings for Misty. Falcon, Moon Knight and Black Widow showed up, attacking them under the control of the Puppet Master until Misty defeated him. Paladin and the other heroes showed up to Misty's control room just as she collapsed. A week later, after Misty had rested, Paladin approached her, realizing they had been manipulated by Puppet Master but he knew someone was behind the Puppet Master. He invited Misty to join him in hunting him down. (Heroes for Hire III#6 (fb) – BTS) – Paladin and Misty decided to rebuild Heroes for Hire, knowing they'd have to prove no one was controlling them any longer. Paladin agreed to take on all the field work for the time being. Misty sent Paladin on a stake-out over a Hook shipment. (Heroes for Hire III#6) – Paladin was attacked by ninjas with bone clubs and was overwhelmed until Spider-Man helped him. Paladin thanked Spidey then tried dismissing him, telling Misty that he didn't get along with Spidey, but Spider-Man wouldn't leave. Paladin gave Spidey a brief explanation then tossed him the headset to Misty for a bit. Misty kept cajoling Paladin about taking his money and he said he knows how people see him. Batroc the Leaper subsequently attacked, breaking a few of Paladin's ribs, and Misty brought Spider-Man on payroll to help. (Heroes for Hire III#7) – Paladin, wounded and feeling down, took a cab to the place where Spider-Man battled the criminal dealers who were using the demon guns and who had more Savage Land human trafficking victims. Misty wanted Paladin to go to a hospital and he felt rejected and furious, throwing himself back into the fight. (Heroes for Hire III#8 (fb) – BTS) – Paladin messaged Satana for help. (Heroes for Hire III#8) – Paladin avoided Misty's check-in as he battled more ninjas. Satana showed up to render the demon guns inert and he flirted with and protected her as she cast spells. They soon rejoined with Spider-Man and Misty, and Satana told Misty that Paladin's motivations were more than money this time, referencing his feelings for Misty. After they saw Batroc arrested and his associate Scorpion escape, they went back at Paladin's apartment, where Misty realized the man behind all of this had bugged them and was listening in. (Spider-Island: Heroes for Hire#1 (fb) – BTS) –Mayor J. Jonah Jameson hired Heroes for Hire to help protect the city during a spider-monster outbreak, resulting in millions across the city developing spider-like superpowers, with many mutating into monstrous spiders themselves. (Amazing Spider-Man II#670) – Paladin and the Heroes for Hire battled mutated spider-monsters in New York City. (Spider-Island: Heroes for Hire#1) – Paladin and the Heroes for Hire worked to protect the borders of New York City, fighting villains like Chemistro, Nightshade, Cottonmouth, Mr. Fish, Spear, A.I.M. and Copperhead. During the fight, Paladin demonstrated spider-strength and agility. Soon, hairy spider-legs sprouted out of Paladin's back and he locked himself in a building, where he completed the transformation into a monster. Misty found him and Paladin attacked but Misty countered with her own spider-powers. They spent the evening having a heart-to-heart, both further transforming. They were later cured. (Heroes for Hire III#9) – When the Asgardian Serpent arrived on Earth, the Thing was corrupted by the Serpent's servant Angrir and attacked the city. Paladin was struggling to survive when Misty recruited Gargoyle to help him and they focused on saving civilians. (Heroes for Hire III#10 (fb) – BTS) – Paladin and Gargoyle saw Thing/Angrir level Yancy Street. (Heroes for Hire III#10) – Paladin and Gargoyle reported in to Misty then went to help civilians. Monster (Brady Briedl) attacked, transforming into their greatest fears. Monster changed into a superior form of Paladin, who was stronger, better and faster, and Paladin was swiftly defeated by someone he could never measure up to. (Heroes for Hire III#11) – Misty arrived to find Paladin and Gargoyle badly beaten and she ordered them back as she took one of Paladin's guns and faced down Monster, who fled after she overcame her fears. (Heroes for Hire III#12) – Paladin aided Silver Sable in shutting down a Hook lab and he admitted that he was working for free on these assignments, shocking Sable, who teased him about having feelings for Misty, though he denied it directly to her. Misty got Stingray and Namor to shut down Hook permanently then she and Paladin had a drink together. (Fear Itself I#7/4 – BTS) – Paladin was considered as a mercenary to hunt down Marcus Johnson (aka Nick Fury II). (Daredevil III#5 – BTS) – Paladin was on a list of people Bruiser wanted to beat up. (Villains for Hire I#4 (fb) – BTS) – Misty and Paladin began working with Puppet Master, who wanted to take down Purple Man and his new criminal organization. Paladin agreed to use the cover identity of Scourge, keeping a mask over his face that would protect him from Purple Man's control, and knew he'd have to pretend to play both sides. (Villains for Hire I#0.1 (fb) – BTS) – Misty Knight began assembling her new operation. She and Paladin, whom she called "Pal-O-Mine," spent weeks making plans. (Villains for Hire I#0.1) – Misty had Paladin find the leader of the smuggling ring, Sidewinder, and take him down. (Villains for Hire I#1 (fb) – BTS) – Misty Knight put together a team of criminals to take down Purple Man in a complex plot. She hired Shocker, Bushmaster, Bombshell, Nightshade, Tiger Shark and Vengeance. To aid her, Paladin went undercover as Scourge. Knight kept her identity secret from everyone but Scourge. (Villains for Hire I#1) – Knight deployed Scourge to deal with Crossfire with her other operatives completed an assignment. 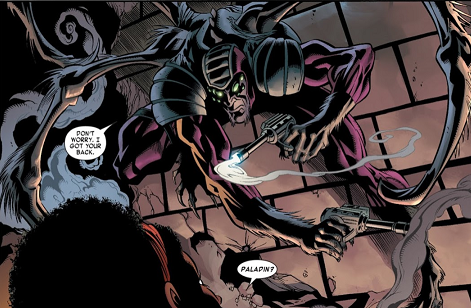 (Villains for Hire I#2) – Purple Man turned several of Misty's operatives to his side and he hired Scourge to stake out Misty Knight. Knight was meeting with Paladin (in his regular uniform) just then and, as Purple Man watched, Paladin confronted Misty on her recent actions and threatened to turn her in, forcing her to seemingly kill him. (Villains for Hire I#4 (fb)) – Cutting his feed, Paladin commended Misty on the ruse, though she'd used a lot of force against him, then he swiftly changed back to Scourge, leaving Purple Man thinking Paladin was dead. 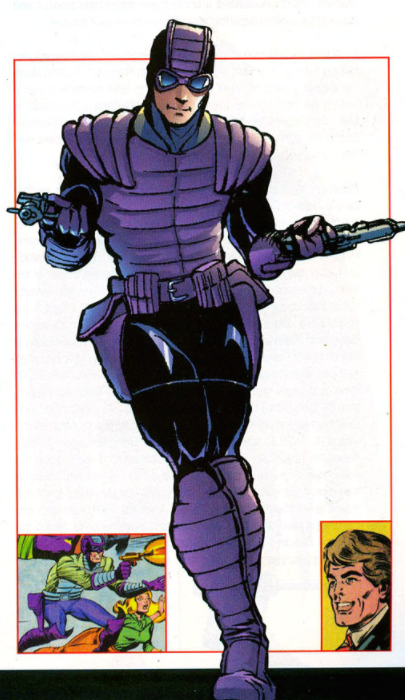 (Villains for Hire I#3) – Purple Man ordered Scourge not to shoot Misty and instead he sent his other operatives in to attack, including Bushmaster, Avalanche, Shocker, Death-Stalker, Tiger Shark, Monster and Bombshell. Misty called in operatives Speed Demon, Man-Ape, Stilt-Man (Callie Ryan) and Crossfire. The two villain teams sparred but Purple Man's team convinced most of Misty's team to join their side. When Crossfire hesitated, Scourge shot him then Scourge was blinded by Misty when she attacked. Tiger Shark ripped Misty's cybernetic arm off then Purple Man and his associate Headhunter showed themselves as Puppet Master revealed he had been controlling Misty during recent adventures. 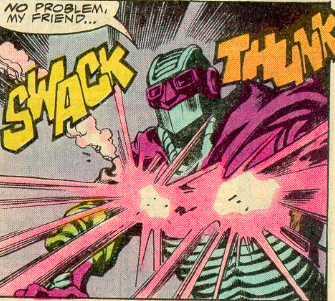 (Villains for Hire I#4) – Puppet Master sought to assert control of all of the villains through their headsets but when the tech shorted out, the villains were freed from any control at all. Misty, after repairing her arm, began fighting back. The villains fought among themselves, disoriented, with several of them escaping, but Scourge shot Avalanche in the leg to keep him from running off. Scourge hit Man-Ape with stun rounds but Man-Ape escaped. Scourge then unmasked as Paladin in front of Purple Man and Headhunter, shocking them. In the end, the criminals were all apprehended by S.H.I.E.L.D., Puppet Master turned himself in and Misty and Paladin shared a kiss. (Deadpool IV#21) – Paladin accepted a hit on Deadpool for ten million. (Deadpool IV#22) – Paladin attacked Deadpool, apologizing and saying nothing personal. As Deadpool fought off the Trapster, Paladin broke the wrist of Agent Scott Adsit, who'd sought to defend Deadpool. Deadpool and Adsit then escaped. (Deadpool IV#27/2) – Paladin attended the bachelor party of Deadpool alongside many others and a fight broke out. (Defenders V#2) – Paladin sat in the waiting room at the Night Nurse's clinic. (Defenders V#5) – Paladin read a magazine while in the care of Night Nurse. Comments: Created by Jim Shooter, Carmine Infantino and Klaus Janson. Given the vast number of times Paladin has appeared, and given his membership on several different teams, it is shocking to me that his origin story, real name and source of his powers has never been revealed. 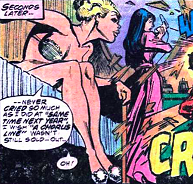 (Daredevil I#150) – Sandy and Connie were visiting New York City from Indianapolis and seeing the sites and shows while staying at the YWCA when Paladin and Daredevil's battle burst into their room. Paladin removed his mask and flirted with the girls briefly before heading back outside. (Daredevil I#152 (fb) – BTS) – Barbie convinced Steve to miss his all-night poker game and go out with him on a Central Park carriage ride. (Daredevil I#152) – During their carriage ride, Daredevil and Paladin battled.